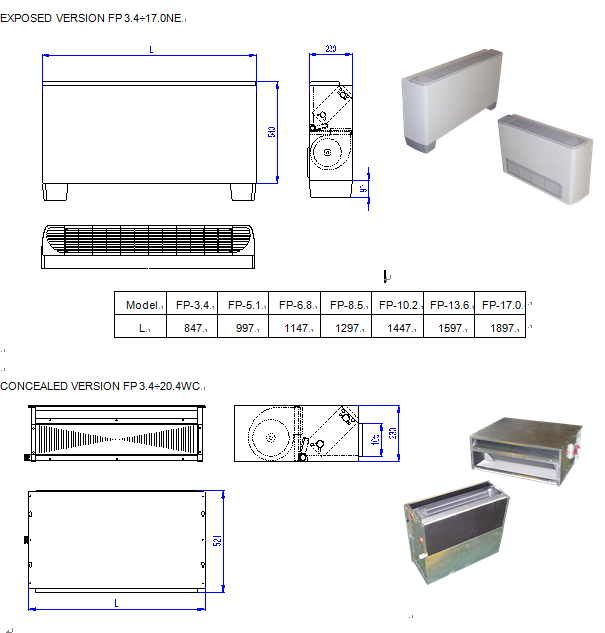 The FP series water chilled fan coil units are designed specially to meet the varied requirements of zone cooling or heating using chilled water or hot water. Fan coil can be applied to two or four pipe systems to satisfy the requirements of a wide variety of air conditioning or heating application. The FP series is available in concealed and exposed versions for ceiling and floor installation. This unit is presented as a single block including: fan deck, cooling and/or cooling coil, removable filter, drip tray, electrical connection box and decorative cabinet (excluded for concealed version). Exposed fan coil units Panels and frame are made of galvanized steel, properly punched and punched for fixing both accessories and the unit itself, either to wall (vertical version) or ceiling (horizontal version). Vertical fan coil The coils are made of seamless tubes expanded into aluminum fins in continuous block. The connections have brass headers with female fittings and provided with easily accessible vent and drainage valve. Floor standing fan coil units The fan decks are composed of double suction centrifugal fans with aluminum impellers and 3-speed fan motors. Each fan motor assembly is dynamically balanced. European fan coil units The easily removable filter is made of filtering honeycomb polypropylene fabric and supported by an aluminum or plastic frame. The drip trays are made from sheet metal treated with polyester powder coating to ensure total resistance to atmospheric agents. The “L” type tray makes the units suitable for both vertical and horizontal installation. FCU All electric wires are connected to enclosed electrical terminal block, situated on the opposite side to the water connections. Water fan coil units The decorative cabinet has a modern design that blends in with any environment. It’s made from galvanized steel treated with polyester powder coating to ensure total resistance to rust, corrosion, chemical agents, aliphatic solvents and alcohols. The discharge grille and supporting legs are made of ABS materials. 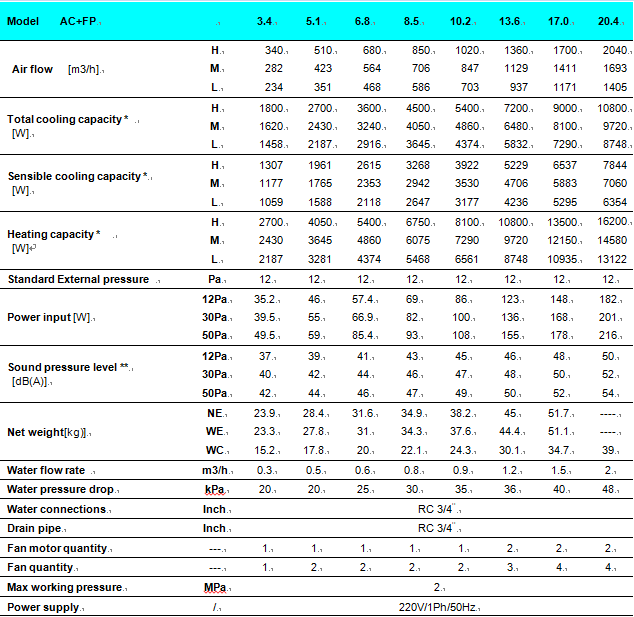 Chiller water fan coil units Mechanical type for two pipe system exposed version use, working mode selection (OFF-Heating-Cooling), ventilation (HIGH-MED-LOW) and room temperature setting. ** Sound pressure measured in anechoic room1.5 maway from the unit.